Use a Journey template to work on or create your own from scratch. Select a precreated starter or create a custom. Journeys makes it easy for you to mix different channels in your journey to reach your customers in the right channel in a timely manner. And why not split your customer journeys into different paths depending on engagement in previous messages, testing purposes or some other customer behavior? Let your creativity mirror your communication flow! What do you want to achieve? What touchpoints do you have? We will keep adding new functionality to Journeys and have a lot of fun things planned. Not only new starters, but also add step actions. Step actions can for example set a subscription status or an attribute value when a contact reaches a specific step in your Journey. It could also trigger webhooks or send a new message in another channel if, for example, an email address bounced. We’re also working on a new Wait-step, that will not wait a number of days but instead wait for an API request to send the next message in your flow. And of course Journey segments that will enable you to create segments based on Journey activity to use in other sendouts. 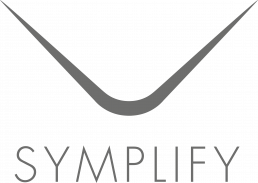 Please note that your Symplify license may affect your Journey usage or limit your access.